I had seen this a few years ago and became enchanted with it although I only recently decided to purchase one for myself. I was a bit surprised by the size of the carafe - I was expecting something about half the volume but that could easily be written off as not reading the entire description as carefully as I might. To remedy the size issue, I simply fill it about half-way. I'm afraid it would be far too heavy for my nighttime fumblings were it full of water. It's adorable though and I am very pleased with it. 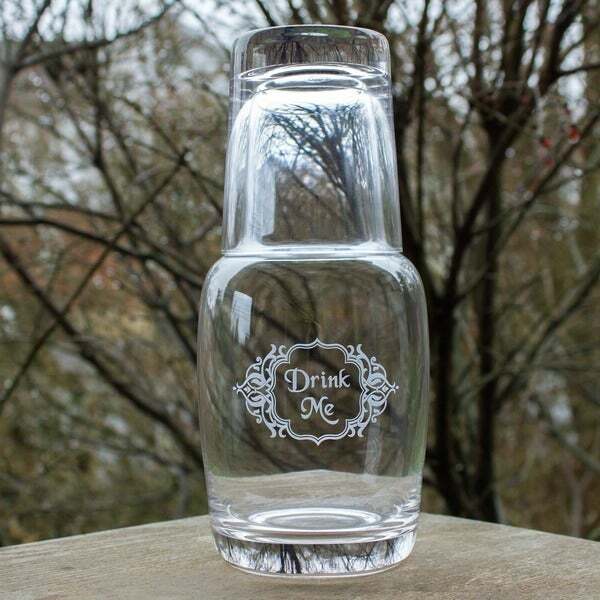 Quench your midnight thirst with this sand etched 'Drink Me' bedside night bottle. Each set contains a carafe and glass, which conveniently doubles as the lid. 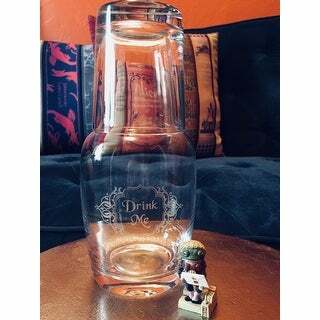 An ornate scrollwork design reading 'Drink Me' is deeply sand etched on the carafe. It's perfect in the guest room or for your own night table. Very charming, yet substantial carafe set. Goes thru the dishwasher just fine. Not light weight, but solid. Love the "Drink Me" label etched on the bottle. Came well packed, and in good time. This carafe is nice looking and is great for keeping on the nightstand! However, just like the Drink Me water bottle, it seems a little delicate. Beautiful and elegant - Exactly what I expected. It is the perfect shape and size for a guest room night table. I will be buying another for the other night table. This carafe is exactly what I was looking to make myself but cost less than what I would have spent on supplies alone. I bought this for my whimsical Alice in Wonderland themed library lounge / guest room. As I am putting together a nice welcome tray with the necessities along with some fun treats for our guests. And a carafe was an absolute must. This was exactly what I was seeking. You will absolutely love this piece too. This carafe is exactly what I was looking for. I wanted a nightstand carafe that had personality and that's what I got. Holds plenty of water and is made of pretty thick glass. Great for middle of night thirst! Just the right size to put on night stand. Perfect for our guest room. The etching on the glass is nice and the product is exactly what I was looking for at the time. The delivery was fast. I love it. My only little gripe... it is difficult to carry upstairs when filled with water and ice with one hand; slippery and a little too wide for my hand. I have washed this in the dishwasher without any problem. Glass carafe and tumbler is good quality. the decal on the carafe I received is smaller than the picture shows but still super cute. Packaging is great, very little chance of damage during shipping. Super cute! I got this for my husband and he really likes it. It’s been fine in our dishwasher and used multiple times a day/night. Really cute design. "Does this have a lid on it so that you can take it to work and it will not leak?" Unfortunately, it does not have a lid on it. I had been looking for a water cantor for guest bedroom and I really liked the image printed on the pitcher. "What country is this from? Thank you." Hello cynthialuc, this is made in China. Have a great day! "How large (many ounces) is the drinking glass? Thanks!" Hello kriskw, the bedside carafe holds approximately 32 ounces. The glass holds approximately 14 ounces. of water. This set is also dishwasher safe. I hope this info helps! Thanks for shopping with us. L.B. "Is the "Drink Me" sand etched of a "stick on"?" Hello oldman2042, Thank you for inquiring about the 'Drink Me' 2-Piece Bedside Carafe and Glass Set. The "Drink Me" is etched with sand. Thank you for shopping with us.